This is truly a delightful book. 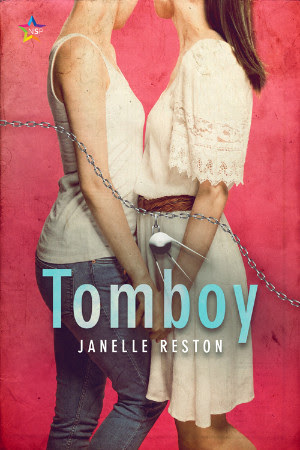 This book is a lesbian romance and coming of age story about young Harriet Little and tomboy Jackie Auglaize. The path is not quite smooth for either of them however, as Harriet is not always sure what she wants. The 1950s are maybe the most heavily stereotyped decade of the previous century, and it is difficult to write about them without an over-larding of negative stereotypes or the sickly scent of “Happy Days” nostalgia. Janelle Reston, however, has avoided both extremes with a portrait of two young people caught in the tensions of the time. The portrayal of Jackie is one of the strongest parts of the book. As a child she is described as looking like “Dennis the Menace.” There is subtlety in the nature of her gender, however, and in what it is that attracts Harriet to her. Yes, Jackie is a Tomboy, and yes, she is a mechanic, working on Volkswagens at a time others might have looked askance at them because of their association with the recently defeated Nazi regime, but this is no over-simplified girl-in-pants character. From the first page to the end the pacing is very good. It might slow down just a tad around the middle, but it picks up again without much delay, and on the whole is handled very skillfully. And this is just what is needed as Harriet’s desires turn this way and that between Jackie and her rival, Mandy Pinkerton. Check this book out. You will very much enjoy it!